Tractor Magnetic Sweepers Designed for "Off Road" Conditions. We offer a number of different Tractor Magnet options because tractors come in many different sizes from small to large. In addition, tractors are utilized in many different environments from relatively flat benign conditions such as facility and lawn maintenance activities to rough construction sites and farm type conditions. Therefore, our Tractor Magnet selection are magnets best designed to accommodate tractors of varying sizes and to accommodate operating environments of varying harshness. Which Type of Tractor Magnet is Right For You? A tow behind magnet uses a ball type hitch or wagon style pin hitch. An optional pintle ring hitch is available on some tow behind magnets. These tow behind magnet trailers are as off road capable as the tractors that pull them. 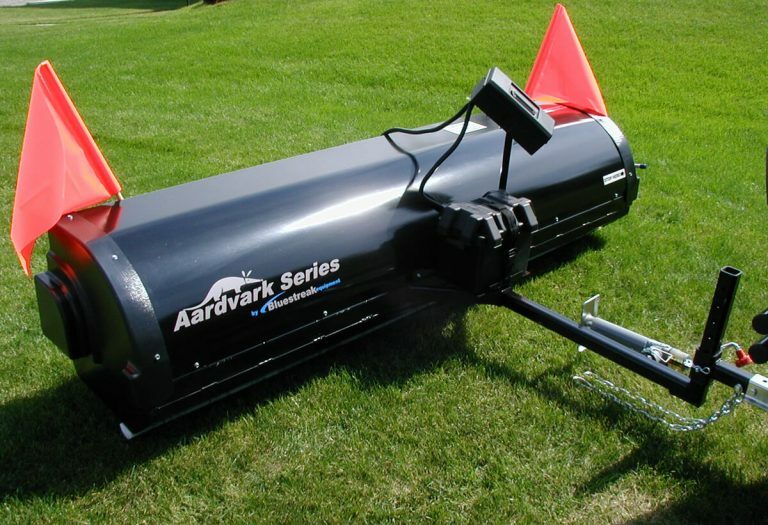 Designed for off road conditions on farms, construction sites, and equine facilities, etc. 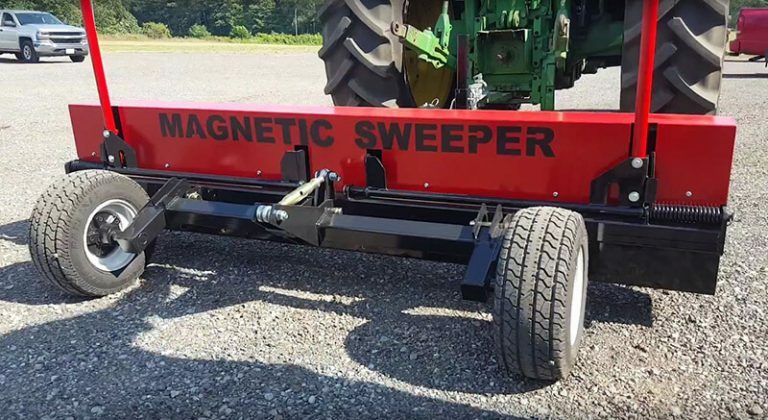 All tow behind magnets for tractors can accept an optional Debris Digging Rake accessory to turn over and loosen up embedded debris in the ground before the magnet passes over it and to make it easier for the magnet to pick up embedded debris. Why Select a Tow Behind magnet? 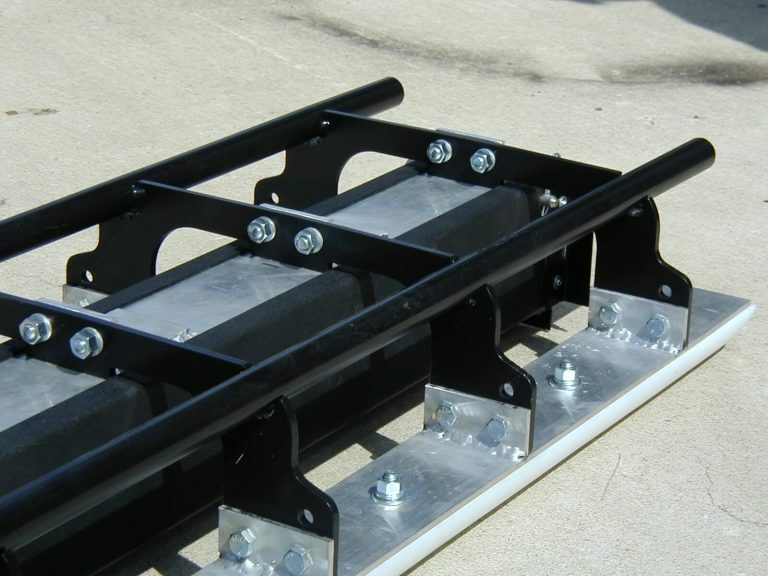 Tow behind magnets are the easiest to use, you just hook them up like any other trailer. It’s quick and easy. 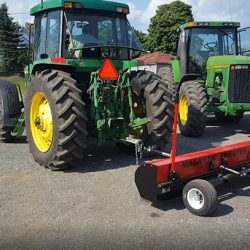 If you want a lot of magnet strength, we have several tow behind tractor magnets that are more powerful than the biggest hanging magnet we have. Why You Might Not Want a Tow Behind magnet? The first reason is that you’re towing the magnet and therefore running over all of the debris before you pick it up. The second reason is that they tend to be more expensive because you’re paying for the frame and wheels etc. and not just the magnet. Hanging magnets are hung from the front, rear or mid mounted underneath of the tractor. All of the hanging magnets selected here are capable of off road conditions with slightly varying features to suit both different tractor and environmental needs. Why Select a Hanging Magnet? The first reason is that they give you a lot of mounting location options. You can hang them in front of the tractor so that you don’t drive over the debris before picking it up, which is really important if you have debris that can cause flat tires. You can hang them in the middle of the tractor and leave it there out of the way so that it’s always working. You can hang it on the back also if you want to take advantage of the 3 point hitch on the tractor. The second reason is that hanging magnets are usually cheaper because you’re essentially only paying for the magnet and not much more. Why You Might Not Want a Hanging Magnet? Hanging magnets can require you to think through and possibly rig up some hanging points if they don’t exist on your tractor where you want to hang the magnet. A magnet may work really well at picking up debris, but how easy is it to clean off? This is where your magnet choice can go off the rails. Think through how you would clean the magnet off step by step. Make sure it makes sense to you and your situation. We try and do this for you so that clean off isn’t a difficult or time-consuming task, but some manufacturers don’t. Pay attention to the details of how this will work from start to finish, right up to the point of getting the debris in the garbage or scrap bin. For instance, at Bluestreak we believe we have the best hanging magnet clean off system which is the Quick Clean Off Sleeve. And the reason for this is that hanging magnets are always hung under something, and the Quick Clean Off Sleeve allows you to clean a hanging magnet off while it is hung under a piece of equipment. The Quick Clean Off Sleeve allows you to pull the sleeve off and have all the debris fall off on the side that your pulling the sleeve off from without crawling under the piece of equipment to clean the magnet off. No one else really has an effective clean off system. Many companies use “kick down plates” or “hinged trays” on the bottom of the magnet, that are hinged on the magnet on one side, but these don’t work if the magnet is hung under a piece of equipment at a height where it can pick up debris. If you tried to swing the hinged tray downward to clean the magnet off the debris would still be at a height where the magnet would still want to pick it up and all the debris would still be under the middle of the tractor not at the side where it’s easy to pickup. Therefore, kick down plates or hinged tray clean off systems only work if you can lift the magnet up to clean it off such as when these types of magnets are used with a forklift to pick them up and dump them over a dumpster. The Bluestreak Quick Clean Off Sleeve is still the best clean off mechanism for hanging magnets. 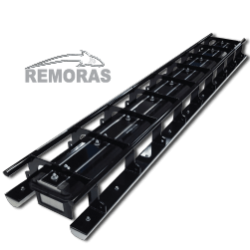 If you have an extensive debris problem that will almost certainly cause a flat tire if you run over the debris, then a front mounted hanging magnetic sweeper is a necessity and may be the only consideration in your choice of magnet. 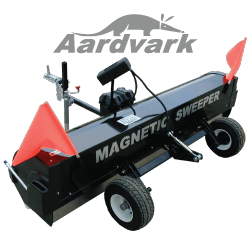 A front mounted hanging magnetic sweeper will pick up debris like nails before you run over it, something that seems obviously and practically much better than running over the debris before picking it up. You are not going to be cleaning your magnet off constantly, so it’s important that when your magnet does pick up a nail or screw that the magnet secures the debris so that it won’t fall off if the magnet is suddenly shaken because of a bump or if the bottom of the magnet hits the ground and the debris is wiped backward on the magnet. The last thing you want is for the debris you just picked up to fall off again. 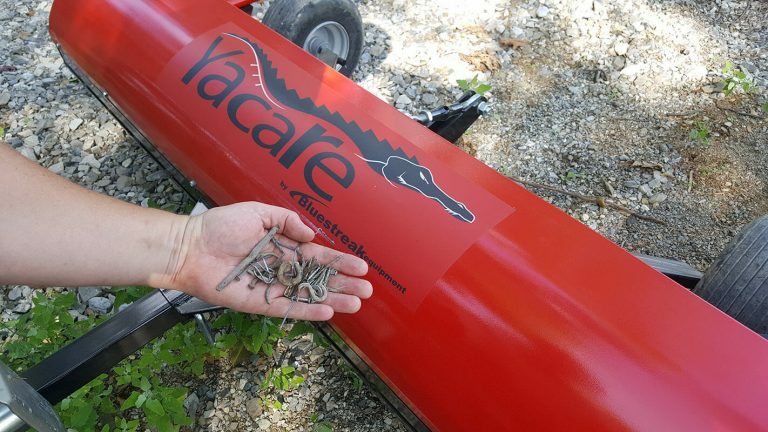 Make sure your magnet has some feature like our “Wrap Around Feature”, it not only makes sure debris doesn’t get wiped off the bottom of the magnet, it makes the debris holding capacity higher and you’ll find in practice that most of your debris ends up on the side or back of your magnet not the bottom of it. And that’s a good indication to you why we have this feature. Hanging magnets are the most cost effective because a hanging magnet is essentially just a big magnet bar without most of the other mechanisms that accompany a tow behind magnet. 5. Are You Able to Leave The Magnet Mounted? Given the other tasks the tractor is used for. Are you able to leave a magnet on the tractor all the time? If not, then the tow behind solution may be best for you because it can be easily and quickly be hitched up when needed. A hanging magnet will be a bit more involved and take more time to mount and demount from the tractor when you want to. On the other hand, if you can mount a magnet permanently on your tractor, it’s going to work for you all the time while you’re driving around and it saves you the time of temporarily mounting and demounting it. Therefore, if you can leave a magnet mounted, a permanently mounted solution is usually better. 6. 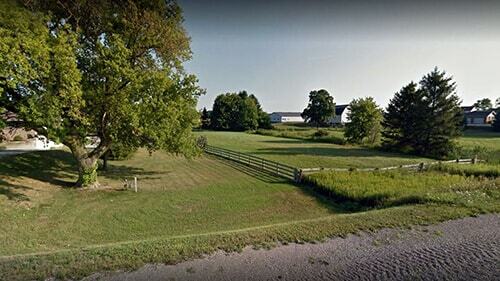 The Terrain and Conditions Your Tractor Operates In? The rougher, dirtier terrain your tractor operates in, the stronger the magnet your likely going to want because the magnet will have to be set higher to avoid constantly hitting the ground. The magnet will also need to pick up debris through some dirt, therefore, you need a stronger magnet. The rougher the terrain that exists because of things like bumps and pot holes the more you will want or favor a magnet that has some protection built in to the design to either deal with the abuse of hitting the ground or being able to move out of the way when it does hit the ground in order to prevent damage. We want to make sure our products meet your expectations. 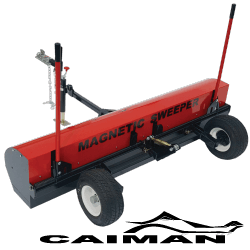 Therefore, make sure you take a look at our “maximum lifting distance” specification for each magnetic sweeper (see lifting distance of tractor magnet selection here). We bench test every one of magnetic sweeper models to determine their maximum lifting distance of a two-and-a-half-inch standard nail. Everyone knows what a two-and-a-half-inch nail looks like which is why we use this standard measure of magnet strength and it will give you a very good idea of magnet performance. Many times, we have videos of our products picking up various other materials so take a look at the videos in the video galleries. They give you a chance to “kick the tires” and see how the products perform. Many of these videos have been submitted by previous customers. 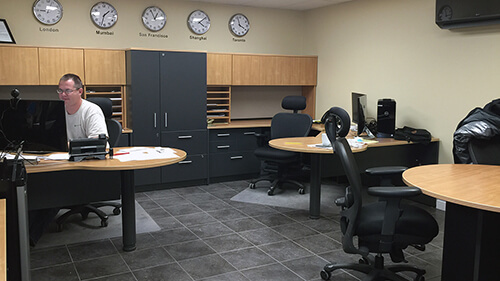 All of our products are designed and manufactured on site at our facilities in Ontario, Canada. 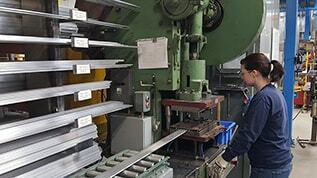 We have manufactured and developed application driven magnetic products since 2005. 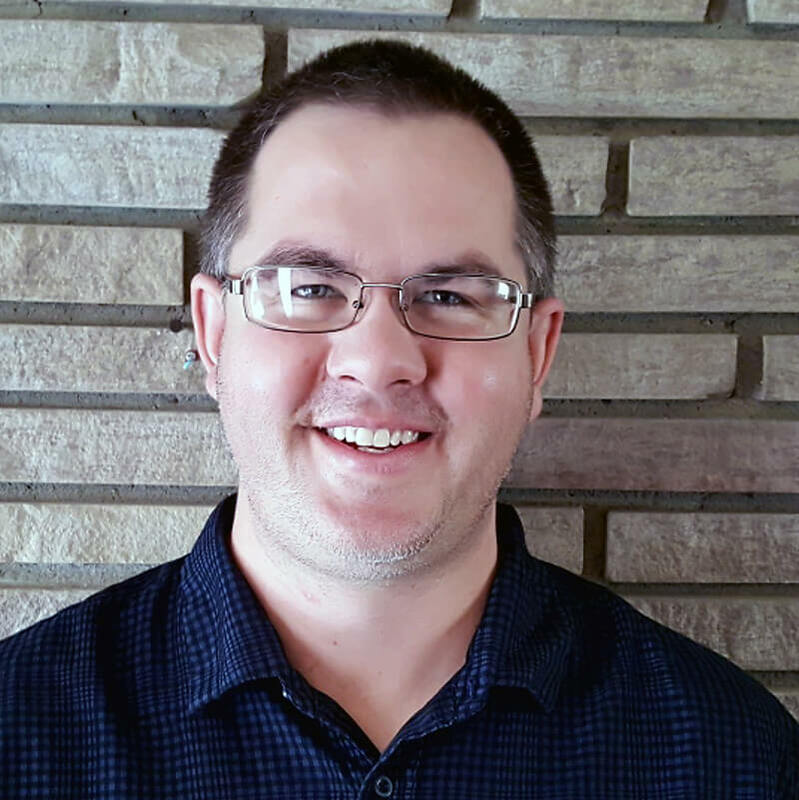 Working from rural southern Ontario, our business has grown and now sprawls over several properties using former agricultural buildings. What do the staff of Bluestreak have to say on the subject of tractor magnets? Whatever type of tractor magnet you think will work best in your situation, make sure you err on the side of getting a bigger stronger one because tractors don’t really have any weight restrictions that would prevent getting a bigger one, and bigger stronger magnets will work best in the off-road type of environments that tractors work in where it’s necessary to pickup debris through grass and dirt. Example Situation Where a Tractor Magnetic Sweeper Is Used. Many times, tractors of various sizes are used in quasi-agricultural, commercial industrial applications. One such example is in greenhouse applications. Greenhouses are agricultural but also commercial industrial in nature, highly mechanized, large outdoor areas, and covered areas, with lots of racks, pallets and equipment. Many greenhouses also do substantial boxing or casing of plants for shipment. One source of debris are the large staples that hold the boxes/cases together. Stray staples from the boxing and casing activities can cause flats on tractors and other vehicles that move orders and supplies around the facility. Therefore, some facilities permanently mount a hanging magnet under the tractor between the front and back wheels on several of the tractors in their fleet to constantly sweep the entire facility for flat causing debris and just metal debris in general. Selection of Tractor Magnets designed for "Off Road"
This thing is built like a tank! The Yacare magnetic sweeper is a powerful off road tow behind magnetic sweeper with a Spring Assisted Debris Release System that makes cleaning off the magnet easy. Even when the magnet is heavily loaded with metal debris, cleaning it off can be done in seconds without much effort or bending over. 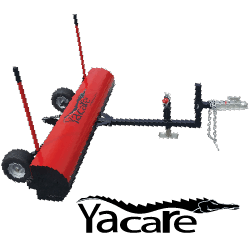 The Yacare’s 72″ wide sweeping width fits smaller tractors perfectly. 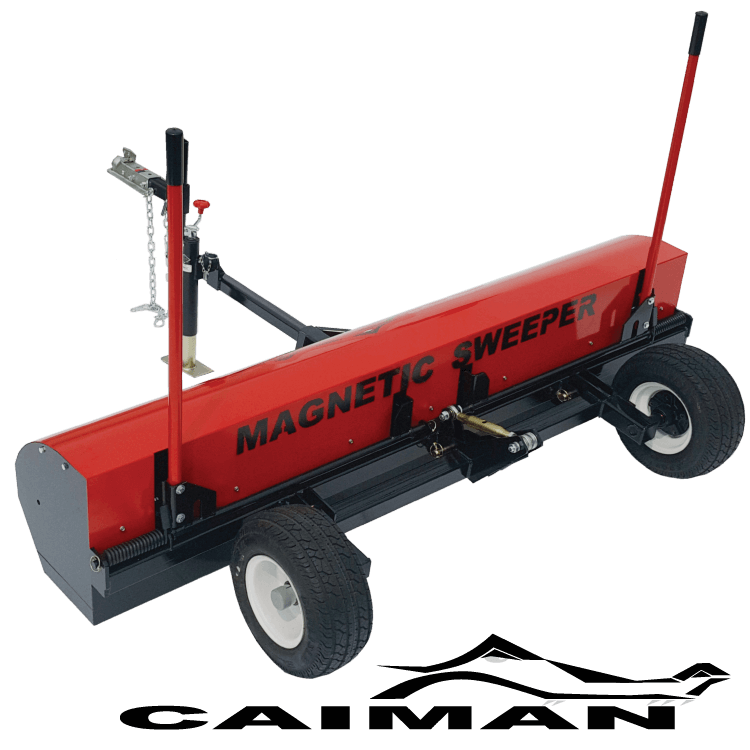 The Yacare magnetic sweeper is built to stand up to rough off road conditions with solid steel construction, protective steel lid that encloses the magnet, height adjustability, “Wrap Around” feature and inset 13″ x 6.5″ flat proof Carlisle ball bearing wheels. The Caiman magnetic sweeper is one step up from the Yacare magnetic sweeper. Like the Yacare, the Caiman magnets are protected and enclosed. The Caiman also has the Dual Spring Assisted Debris Release Handles for easily remove the debris from the magnets. However, the Caiman is wider at 82 inches and it has more power with 50% more magnets than the Yacare. With more power and a wider sweeping width, the Caiman is a solid choice for towing behind larger tractors. The Caiman also has solid pick up performance in off road conditions where tractors often travel. The performance is provided by the “Wrap Around” design, the adjustable sweep height, flat proof tires, adjustable hitch height and optional debris digging rake accessory. Clean Off with a Push of a Button! The Aardvark Magnetic Sweeper is designed for landfills, construction sites, mining sites and off road applications where the terrain may be rough. It can easily be towed behind tractors of various sizes. The magnet housing is fully enclosed offering a level of protection around the magnet. This means you don’t have to worry about metal getting all over the magnet. This unit is packed with all the standard off road features such as sweeping height control and inset wheels, but it also features an automatic clean off system which makes cleaning off debris from the sweeper easy and automatic. Wrapped in A Protective Cage! 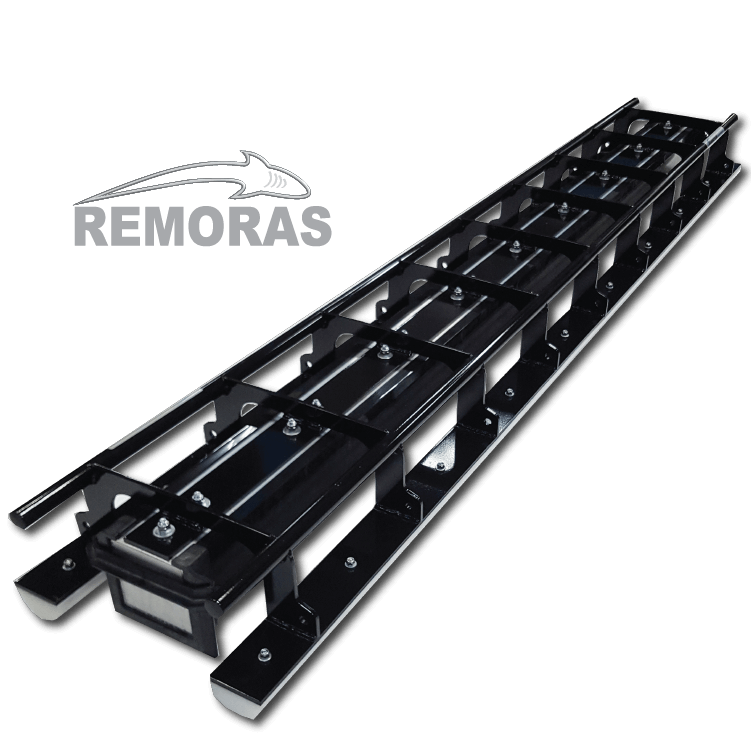 The Remoras magnet is an “all terrain” hanging magnet that you can attach to tractors you already use and own. 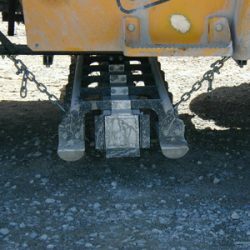 This magnet is specifically designed to withstand frequent ground hits while picking up metal debris from uneven and rough surfaces with potholes and ruts. A protective cage protects the magnetic housing from hitting the ground when your vehicle travels over uneven, rough terrain. Magnets of this type are very useful if there are severe ruts in industrial yards caused by constant use over the same path by heavy vehicles, such as is common in precast concrete yards, where concrete pieces are stored outside in rows or aisles and delivered and removed from those aisles by large heavy forklifts. Maximum Lifting Height 9 3/4" 10 1/2" 12" 8 1/2"
Sweeper Widths 72" 82" 96" 38", 50", 62", 74", 86", 98"
Sweeper Height Adjustment 2" to 6" Continuous Adjustment 2" to 6" Continuous Adjustment 1.5" to 6" Continuous Adjustment Change suspension height by rising or lowering the chains to a specified maximum height of. 5"